My friend Min from The Bad Girl’s Kitchen (we were Taste&Create partners awhile back) invited me to her virtual housewarming extravaganza. I love a good party and checking out a new house, and I can’t say no to great food either (did I hear there will be southwestern tapas and homemade sangria??). Of course I am a well-mannered guest and will bring along something yummy myself. When I think of southwestern food, I immediately think of chiles…and when I think of tapas, I immediately think of gambas al ajillo. I knew that punching up traditional Spanish gambas with some chiplotle in adobo and cilantro would make a great party appetizer (although you do have to make it last minute, so hope Min won’t mind if I use her oven!). Below, I’ve just given a recipe for two servings, but I’m pretty sure it can be successfully multiplied to feed a few more. 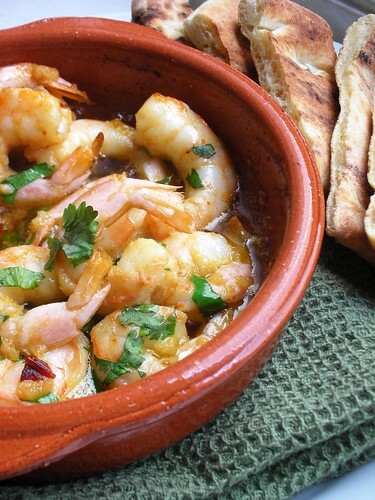 Don’t forget a little bread on the side to dip in the garlic oil….it’s just as tasty as the shrimp! I’m also bringing along guac with spicy toasted squash seeds and oven baked tortilla chips. Truth be told, I could eat the whole bowl myself, but it’s more fun to share. Congratulations, Min and family! Now, where’s that sangria? -Place an oven rack in the middle position and preheat oven to 500°F. In a bowl, combine the shrimp with the chopped chipotle and adobo sauce, about one third of the minced garlic, one tablespoon of olive oil and salt. Let shrimp marinate for 30 minutes at room temperature (this should be long enough for your oven to preheat). -Once the oven is hot, pour the remaining three tablespoons olive oil into a small, shallow casserole or baking dish (or a seasoned Spanish cazuela). Add the remaining minced garlic and the bay leaf and bake until sizzling, about 3-5 minutes. -Add the shrimp and marinade to the sizzling oil, and return the dish to the oven. Bake (stirring once) for another 3-4 minutes, or until the shrimp are cooked through. Throw out the bay leaf, season with additional salt (if necessary) and sprinkle over the chopped cilantro. Serve immediately, straight from your baking dish or cazuela (keeping in mind that it’s super-hot before you set it on your table!) . Steph! You can use my oven anytime, that shrimp looks fabulous! 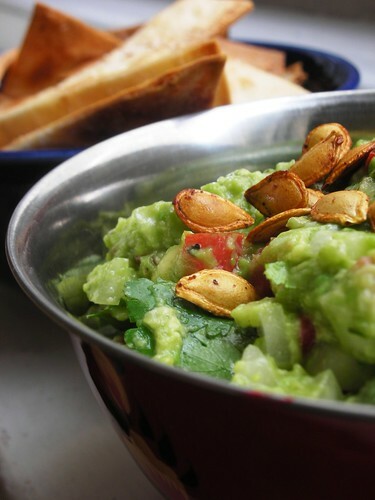 And guacamole with spicy pepitas! Oh my, so fun! Beautiful pictures! So glad you could come! Thank you, and I hope you enjoy the sangria! Looks great! Nice to see savoury food on your blog too, and it looks just as delicious as all your sweet treats. That’s the kind of food I’d like to have at any party! It all sounds delicious and fun. Yes, bring on the sangria! Yum! Shrimp and guacamole… it doesn’t get better than that ;). This looks delicious! What a great appetizer. I’m going to make this soon! Hope you are well. This shrimp looks incredible Steph. Just stumbled upon your blog. That shrimp looks fantastic. 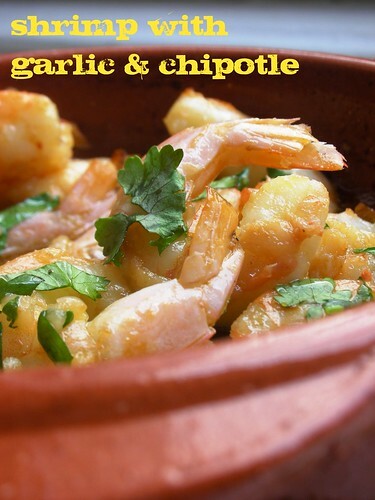 I love garlic and chipotle so those shrimp definitely sound like something I would enjoy. I’ve also never been one to turn down guac. I’m very happy fall is here because it means I can finally make my favorite guac recipe from Epicurious with pear and pomegranate seeds but your version looks fantastic as well. Nothing like using some squash seeds to add textural variation to guac.